The California International Law Center at King Hall, for which I serve as founding Director, is honored to host a public address by Richard J. Goldstone (below right), on the topic of "International Criminal Justice: Its Successes and Failures," from 12 noon-1 p.m. this Thursday, February 10, here at the University of California, Davis, School of Law. Cohosting will be our students' International Law Society and Journal of International Law & Policy. 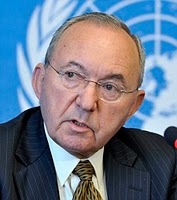 As blogreaders well know (prior posts), Goldstone has a remarkable record of service nationally and internationally, for example: Justice of the Constitutional Court of South Africa (1994-2003); Chief Prosecutor of the International Criminal Tribunals for the former Yugoslavia and Rwanda (1994-1996); Chairperson of the International Independent Inquiry on Kosovo; and Co-Chair of the International Task Force on Terrorism of the International Bar Association. His many publications include For Humanity: Reflections of a War Crimes Investigator (2000) and the coauthored International Judicial Institutions: The Architecture of International Justice at Home and Abroad (2008). Details on Thursday's event are here.